A coalition of union leaders and employers praised Congress for delaying one of Obamacare's most onerous taxes in its government shutdown deal. The continuing resolution to fund the government included a two-year delay on the Affordable Care Act's Cadillac Tax, which would impose a 40 percent tax rate on insurance plans valued at more than $27,500 for families and $10,200 for individuals. The tax has drawn considerable opposition from labor groups who have negotiated generous health benefits for their members. 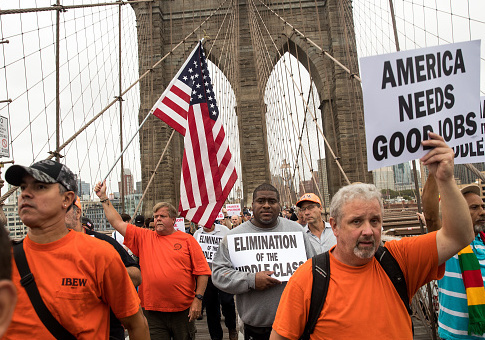 Fight the 40, a coalition of labor groups and employers, commended lawmakers for continuing to block its implementation, said James A. Klein, president of the American Benefits Council and a member of the coalition. "We applaud Congress for delaying the ‘Cadillac Tax' that is driving up health care costs for millions of Americans," Klein said in a statement. "Employer-sponsored health coverage is efficient, effective, and stable. Taxing health benefits would compel employers to stop offering wellness programs and on-site clinics and to reluctantly ask employees to bear higher out-of-pocket costs." Klein said the delay was necessary to help employers budget for future costs "because companies typically make health plan decisions 18 to 24 months in advance." The looming threat of the tax taking effect led some large employers to begin scaling back health benefits beginning in 2013, prompting Laborers International Union President Terry O'Sullivan to call for Obamacare's full repeal if it was not removed completely. "If the Affordable Care Act is not fixed and it destroys the health and welfare funds that we have all fought for and stand for, then I believe it needs to be repealed," he told the AFL-CIO convention that year. A 2015 study from the non-partisan American Health Policy Institute found that 90 percent of employers were taking steps to cut benefits or increase prices to deal with the fallout from the tax. The report found that the tax would hurt middle and working class families, rather than the wealthy. "Although the excise tax may have been sold as a tax on overly generous ‘Cadillac' health benefits, in reality it is impacting ordinary health plans that are expensive simply because they are offered in high-cost areas, or because they cover large numbers of people whose health costs are higher than average—women, older and disabled workers, and families experiencing catastrophic health events," it said. The tax was supposed to go into effect in 2013, but repeated delays pushed back its start date to 2020. It will now go into effect in 2022 under the continuing resolution. In December, a bipartisan group of lawmakers led by Rep. Mike Kelly (R., Penn.) and Rep. Joe Courtney (D., Conn.) introduced legislation to fully repeal the tax, which is a major part of Obamacare's $68 billion tax hike. "The widespread pain of Obamacare's higher costs and broken promises is already being felt by countless families and workers, yet with the law's looming Cadillac Tax, in many ways the worst is yet to come," Kelly said in a statement introducing the bill. "Sensible health care policy should encourage employers to offer a full range of health plans to their associates, not punish them with an unfair tax for doing so. The sad result will be higher deductibles and fewer services for hardworking Americans." Klein said Congress must go beyond delays and work to fully repeal the measure. "Repealing this tax has strong bipartisan, bicameral support. We appreciate the continued efforts of our champions in the House and Senate to work on full repeal," Klein said. The funding bill is set to expire on Feb. 8. This entry was posted in Issues and tagged Health Care, Obamacare, Unions. Bookmark the permalink.